How long should Deck Stain last? How long should a deck stain last? This one is easy to explain. If the structure is in the south, it will fail sooner due to the harsher ultra-violet exposure. Same thing if it’s up in the mountains, and closer to the sun. In the far north, the annual snow pack will take its toll, along with the dramatic freeze/thaw cycles that it goes through. In moderate climates, the stain will simply last longer and perform better because it’s defending against milder conditions. Some woods are denser than other woods, meaning than they will always absorb less stain and because of this, fail sooner. An example of this might be mahogany vs. yellow pine. 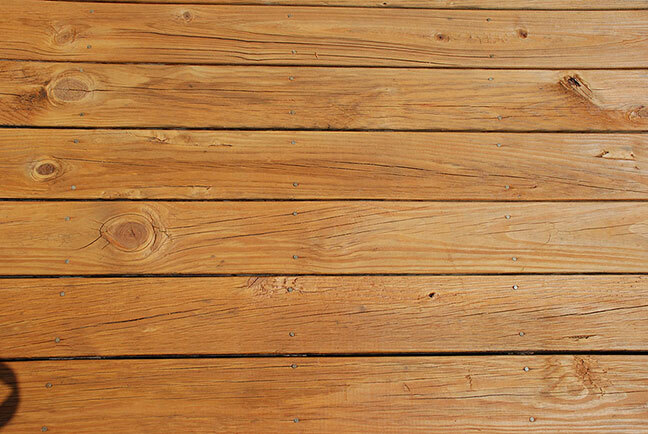 Some woods have more natural oils in them, making them more difficult to penetrate as well…like cedar vs. yellow pine. Even within the same species of woods, the trees that they are harvested from can vary greatly. Deck boards milled from a tree that grew slowly, in a cold, northern environment, are going to be more dense than trees harvested from a warmer climate that grew more quickly. Brand new deck? Stain won’t last as long. The wood is as dense as it will ever be when it is new but, over time, mother nature will weather the boards, making them more porous, allowing them to absorb more stain. Just power washing? Fine, but the stain won’t last as long. Power washing will clean off the surface of the boards but it doesn’t help with porosity at all. Using chemical cleaners and brighteners will always improve the porosity of the boards, allowing them to absorb more stain and to last longer. Using a pump sprayer to apply the stain is fine, but you’ll get the boards to absorb more stain by back brushing it in. Avoiding a hot sun helps as well, as the sun can dry the stain out too quickly and not allow it to be absorbed deeply in to the boards. Stains can wear down too. A high amount of foot traffic, especially in the areas such as the stairs, can cause failure to occur more quickly. Your pets can have the same effect as well.